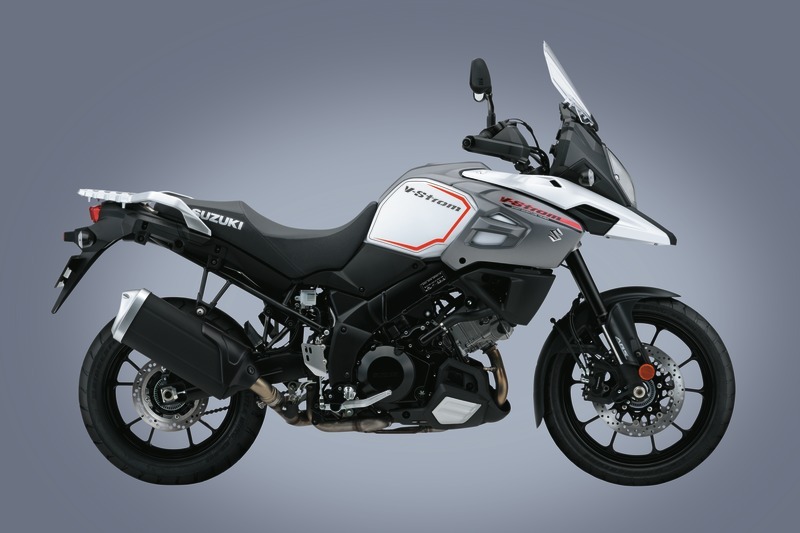 L7 - V-Strom 1000 - ADVENTURE AND SPORT TOURING - MOTORCYCLE - SUZUKI MOTOR - Magyar Suzuki Zrt. 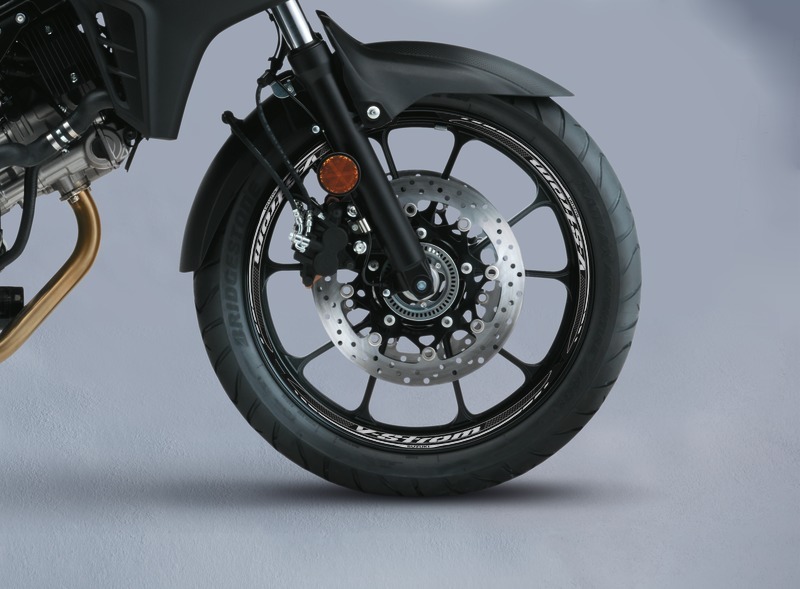 Décor set for front fender. Set of 2 pcs. Carbon, made of Evotec. Four-piece set. Black, made of black stone chip foil. Four-piece set. 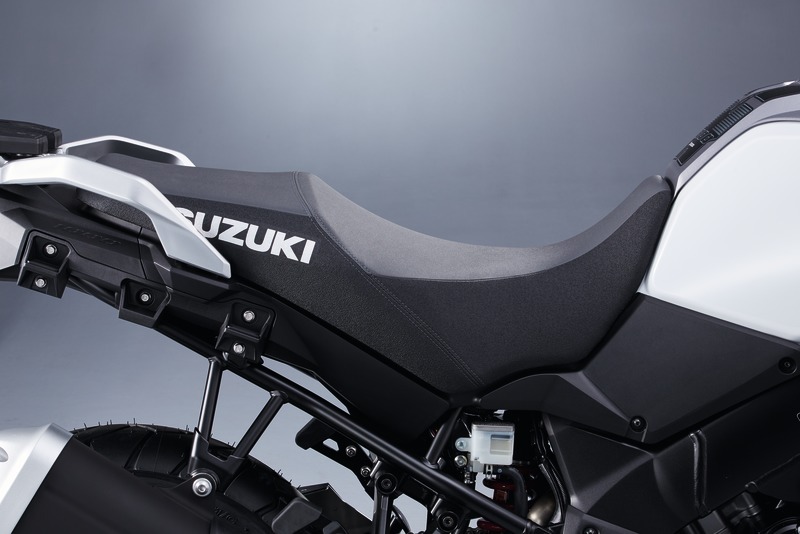 Black protection sticker for clutch cover. 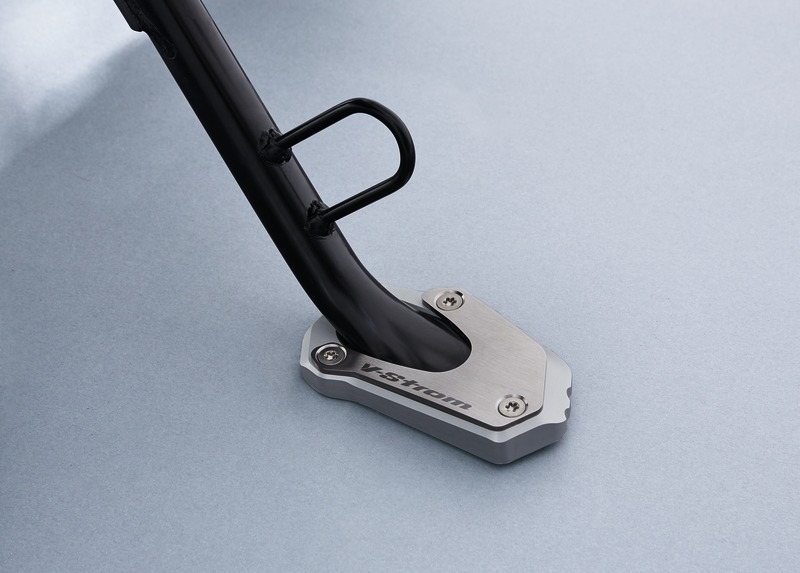 Black grained stone chip protection foil to protect against scratches from your boots. Set of 2 pcs. 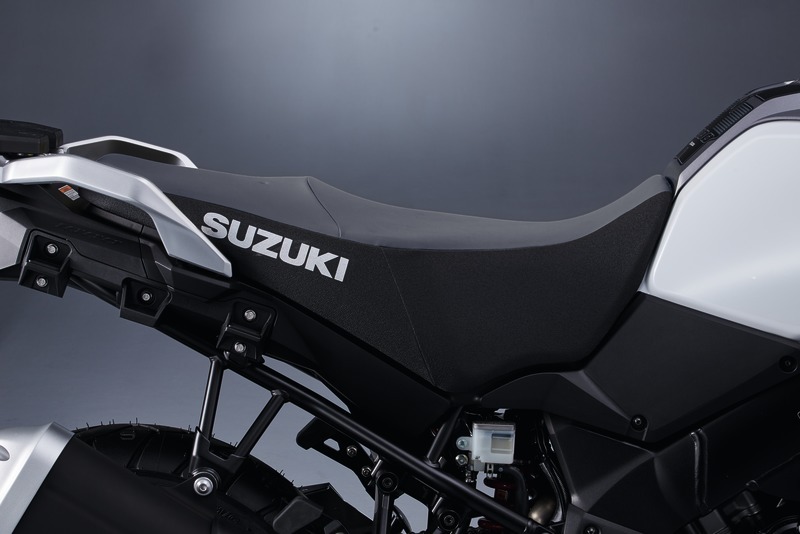 Black grained protection foil with Suzuki logo. Set of two. Size: 16,5 cm x 2,8 cm. 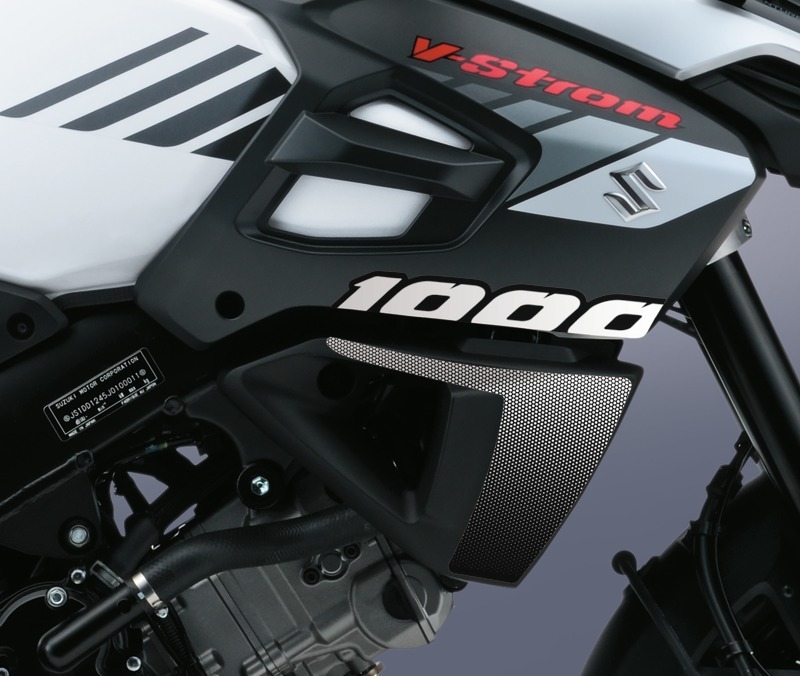 Decals for front wheel of your new V-Strom 1000 to customize the bike’s appearance. Set of six decals for 19” front wheel. Decals for rear wheel of your new V-Strom 1000 to customize the bike’s appearance. Set of six decals for 17” rear wheel. 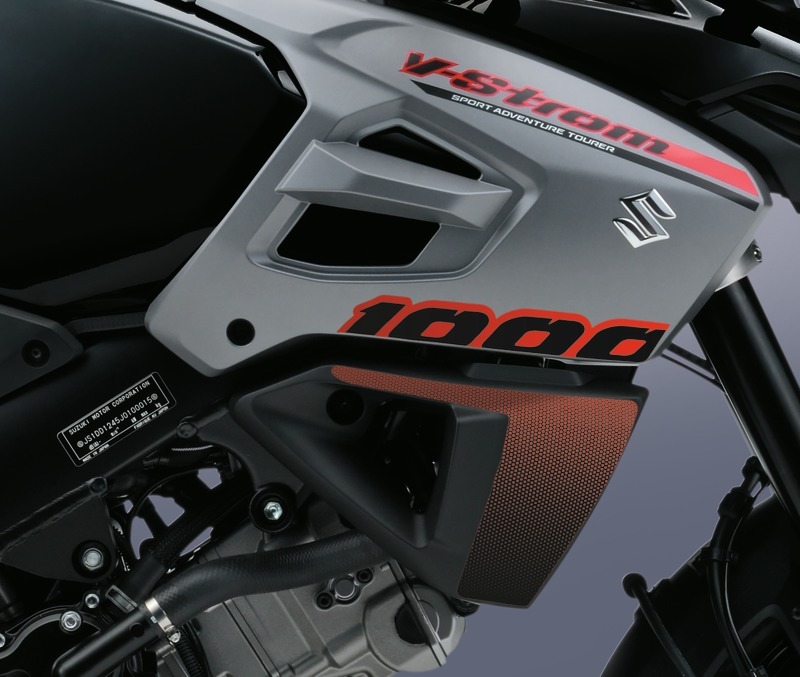 Decals for rear wheel of your new V-Strom 1000 to customize bike appearance. Set of six decals for 17” rear wheel. 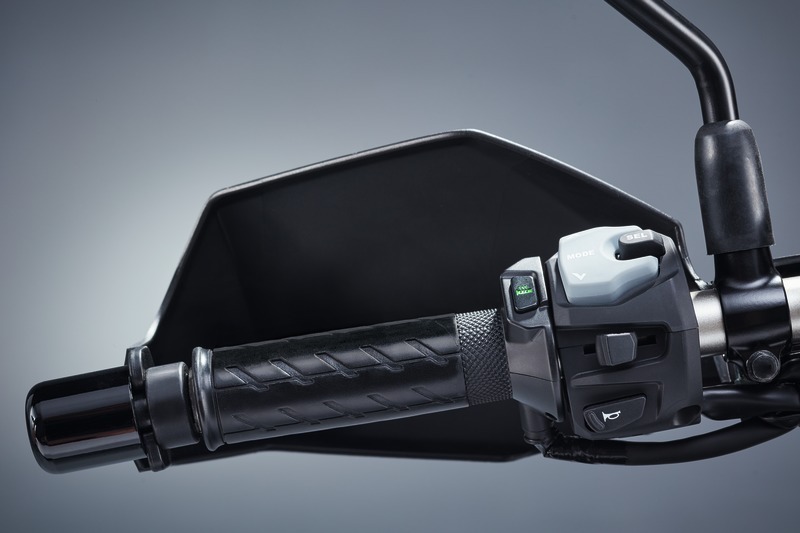 For DL1000AL8~ Navigation bracket with damping system installed at the center of the handle bar, diameter: 22,2 mm. 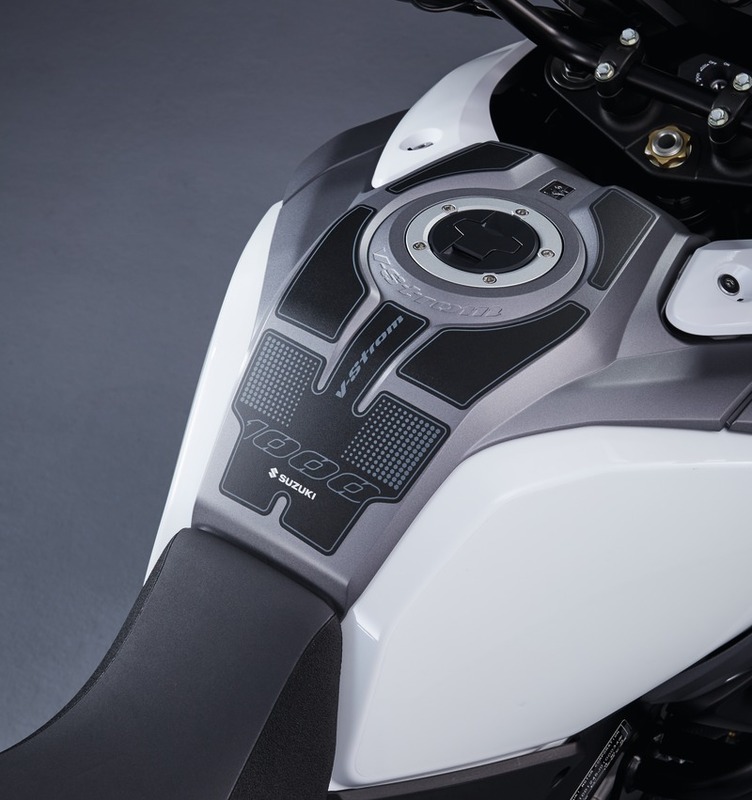 Compatible with several motorcycle navigation systems. 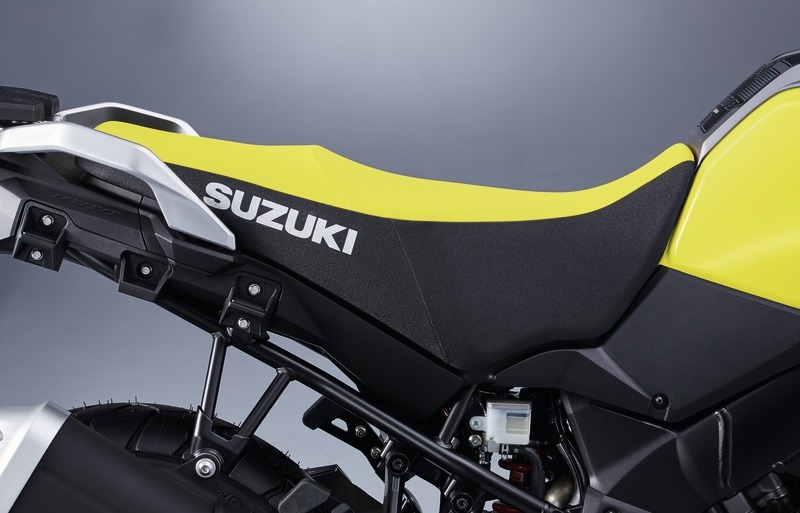 For detailed information please ask your local Suzuki partner. 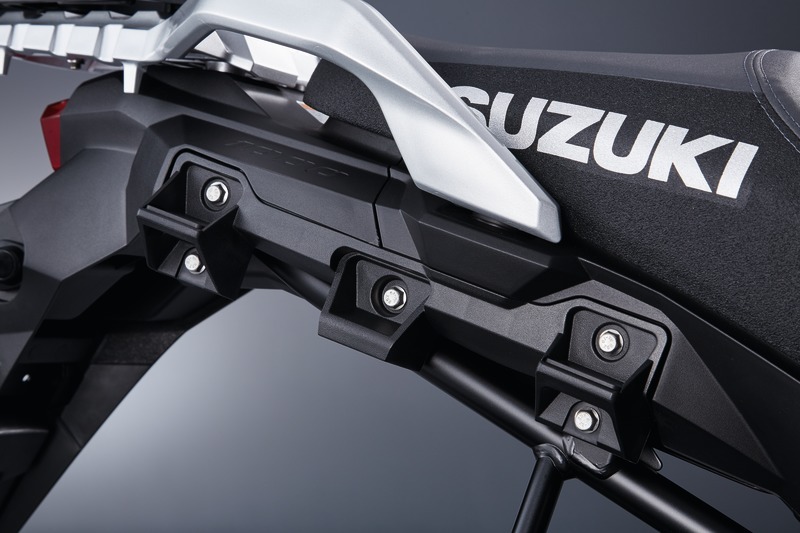 For DL1000XAL8~ Navigation bracket with damping system installed at the center of the handle bar, diameter: 28,6 mm. 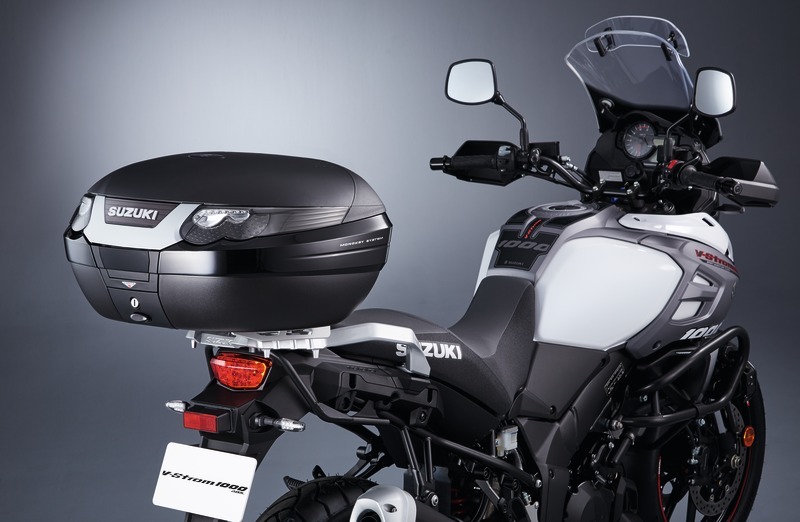 Compatible with several motorcycle navigation systems. 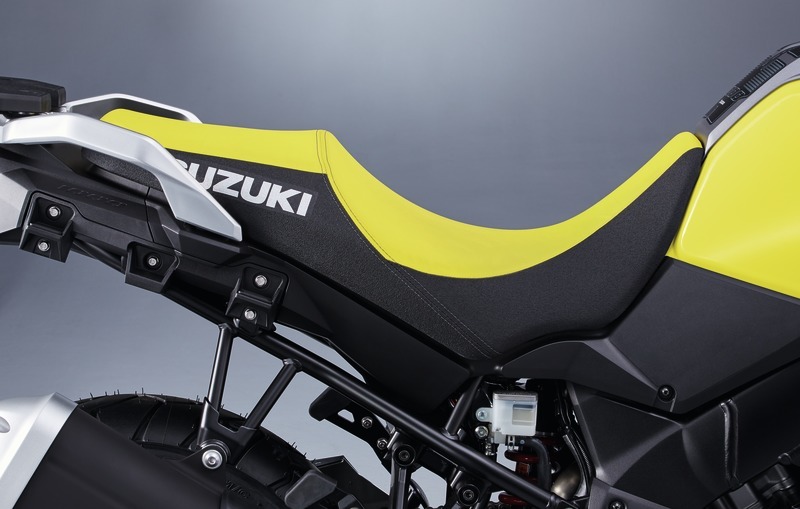 For detailed information please ask your local Suzuki partner. Wiring harness for the alarm system 990D0-ALARM-001 for the new V-Strom 1000. 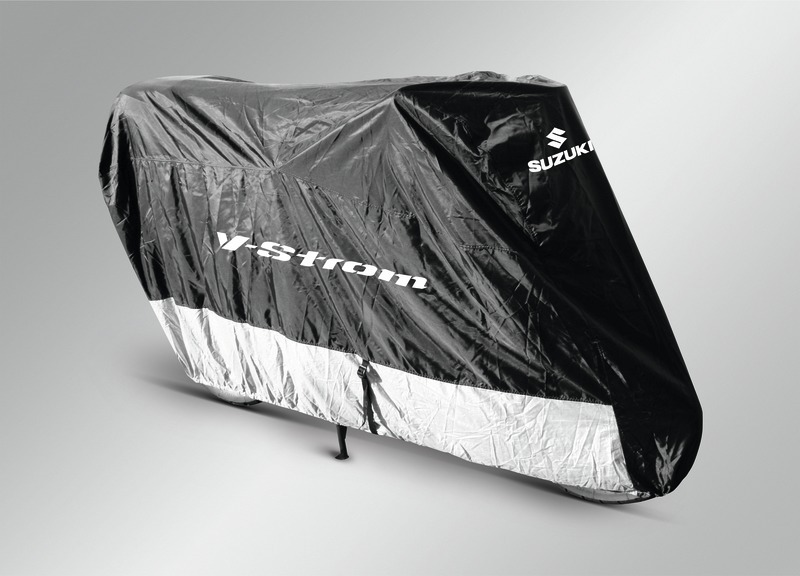 Durable weather proof bike cover with V-Strom logo made out of breathable material which protects your bike from rain, dust and bird droppings when not in use, including inspection window for license plate. 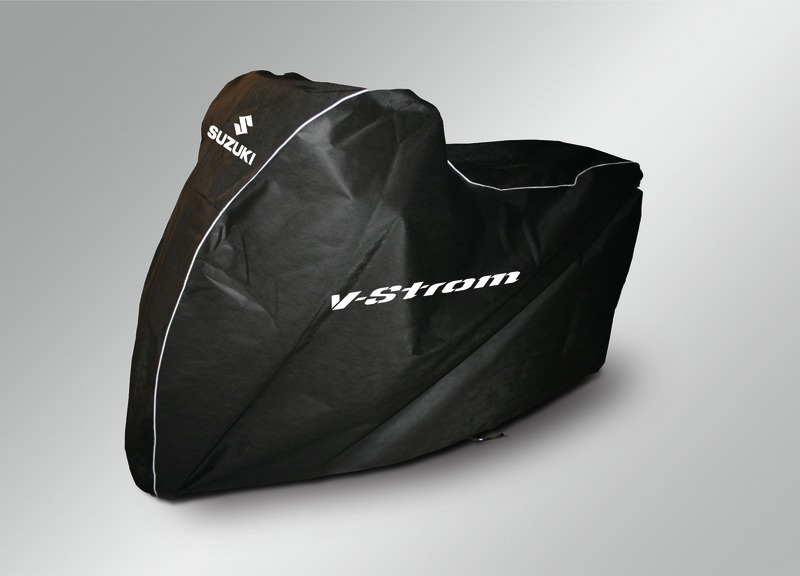 Indoor cover with V-Strom logo for protection of your bike against dust. 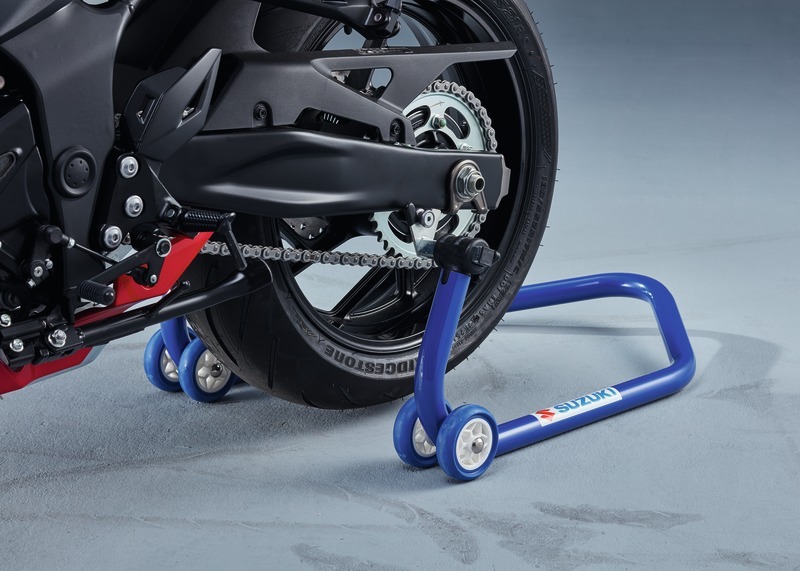 Blue service stand for a secured position of your bike. Suited for bikes with and without ABS. 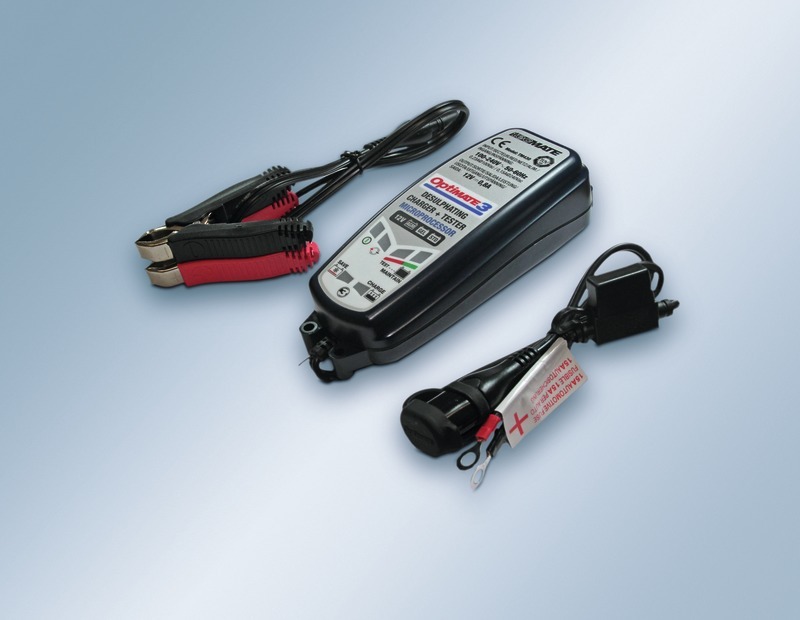 12V Battery Optimiser and Charger - Please note: charger has a 220 – 240 V connection - Application: for all 12V lead acid batteries, GEL, sealed “MF” AGM (motorcycle) or with filler caps. Perfect for batteries of rated capacity 2Ah to 35Ah (it can even maintain larger batteries; it just takes longer to charge). Note: Fitted with European 2-pin plug. 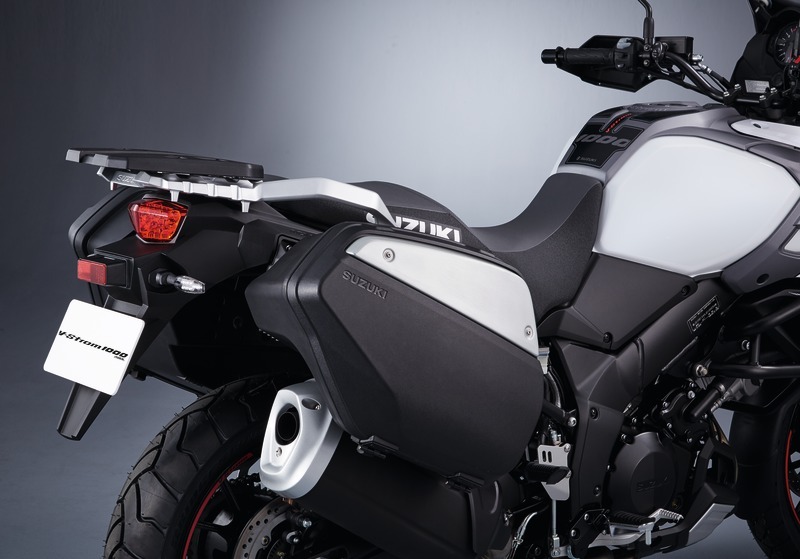 For permanent mounting to a second bike. without warning vest Important note: please note, that First Aid Kits are compulsory when travelling within several European countries. Please check for local regulations while riding outside of your home country. Meets DIN13167 regulations. 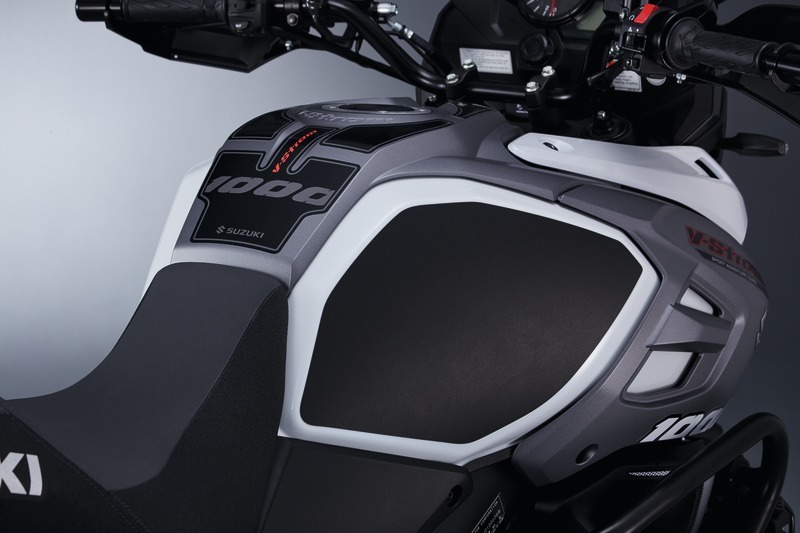 Clear, acrylic glass The 7-fold adjustable spoiler reduces air pressure when driving thus increasing riding comfort even for taller riders. WVTA homologation, DOT mark. There is no such thing as bad weather once you have the best possible equipment. 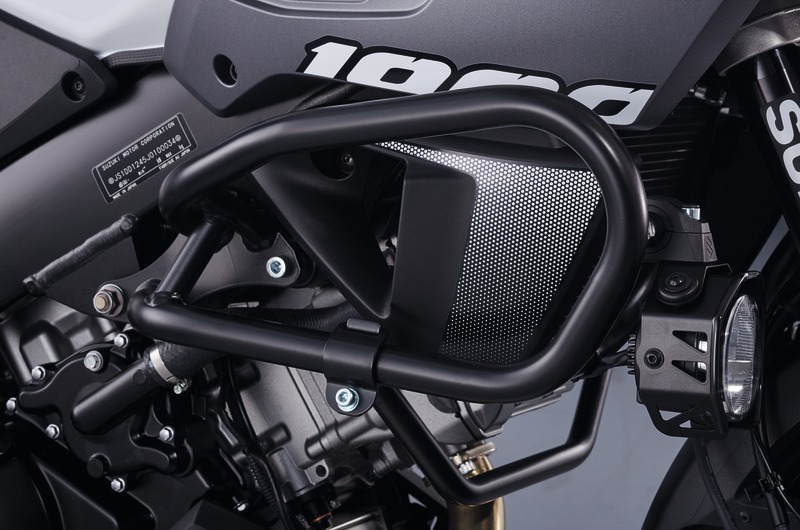 No matter how chilly it may be, these grip heaters will keep your fingers warm as long as you may ride. 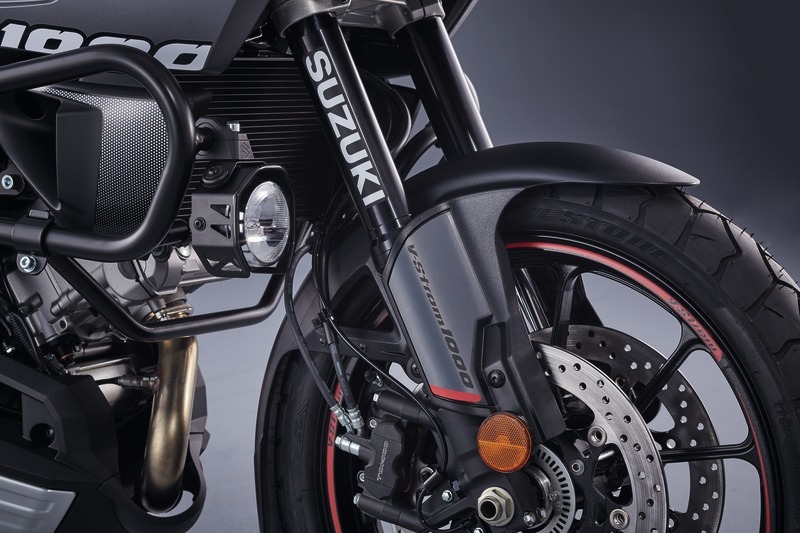 The grip heaters have three different heat settings and a maximum power consumption of 53,9 Watt. WVTA homologation. Black, adjustable up to approx. 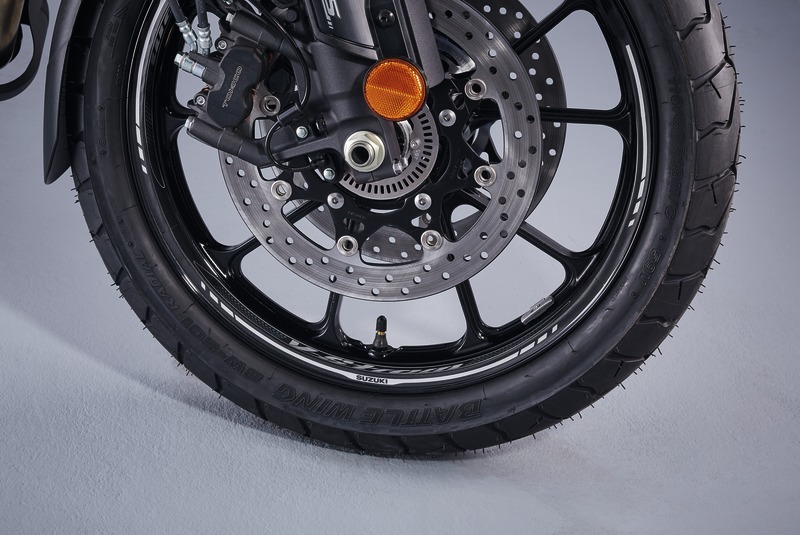 5 mm to the front or rear and 3 positions in height. Set for left and right hand side. WVTA homologation. 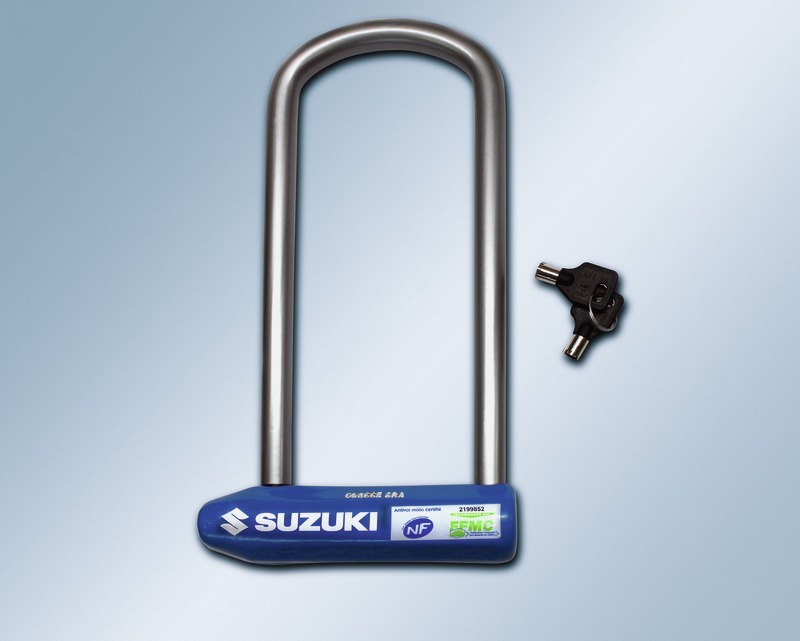 Adds stability when parked on soft or uneven ground, material: aluminium/stainless steel. WVTA homologation. 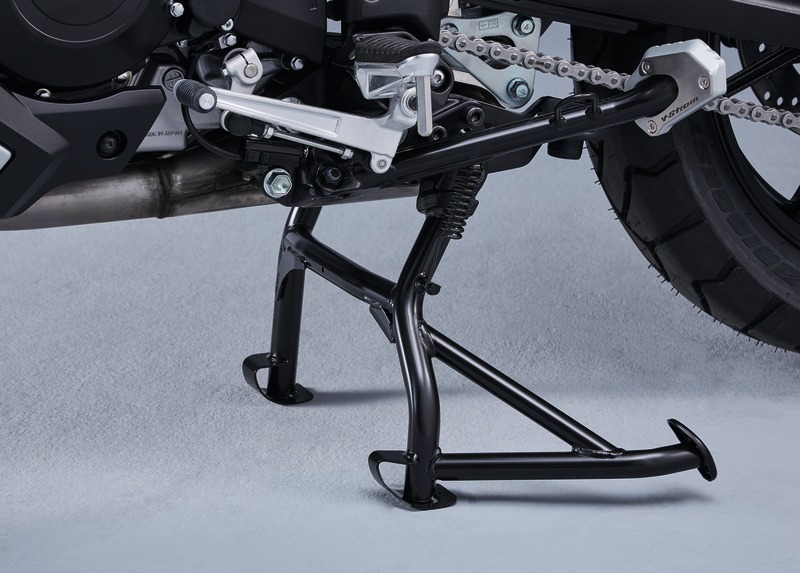 Black powder-coated A useful accessory to bring your bike to a safe and stable standing position. 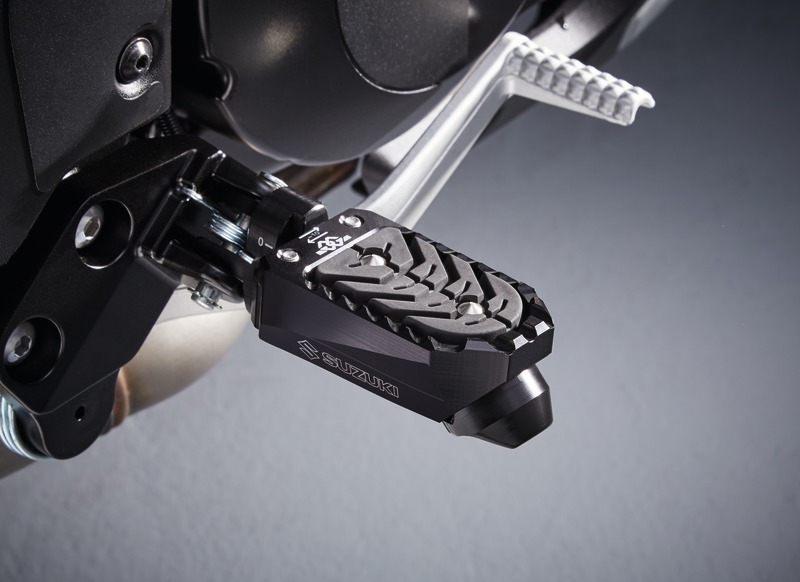 Improves access to your bike for standard maintenance activities. WVTA homologation. 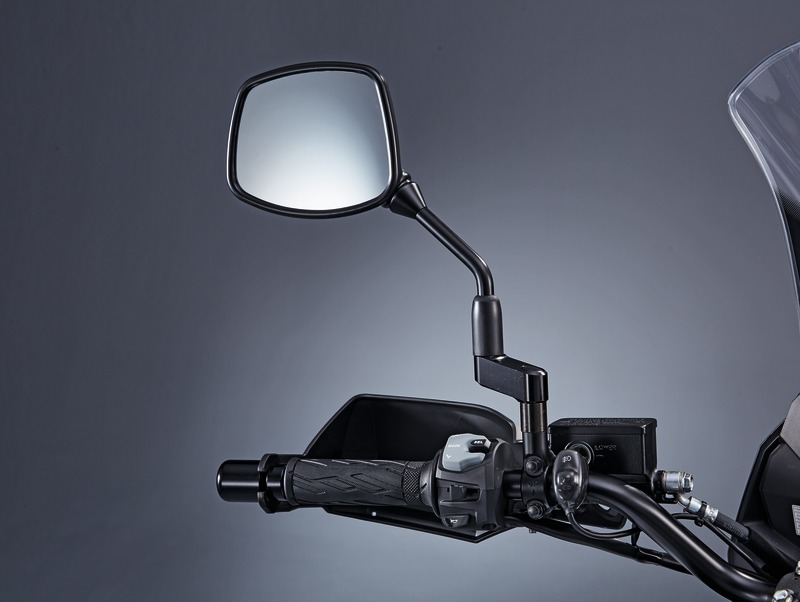 Taller riders will benefit from differently mounted rear view mirrors when riding. 51mm higher mirror position adjustable up to 40mm sideways. Set of two. WVTA homologation. 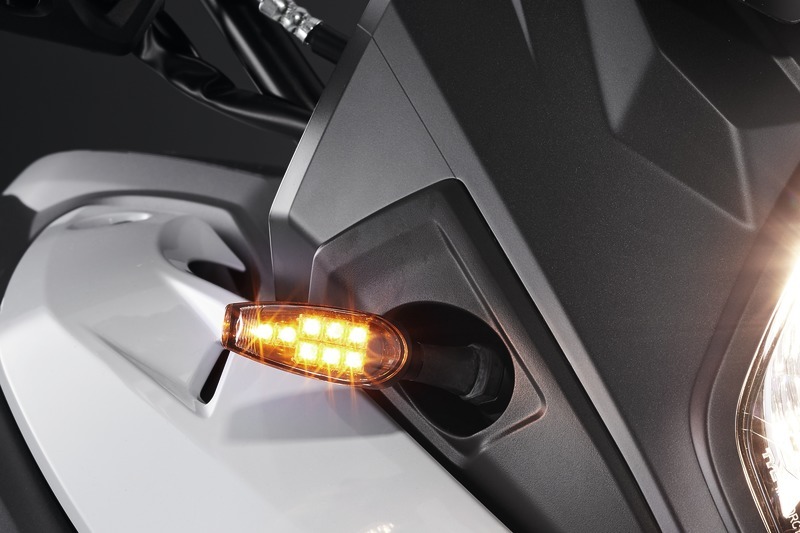 High-tech LED turning light. 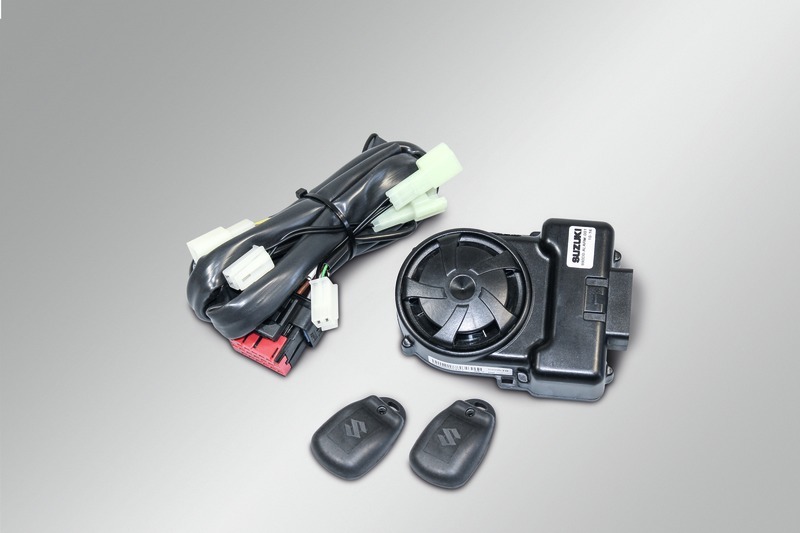 Set of two front and two rear turning lights including wiring harness and relay. Low power consumption (1.2W each), 8 bright LED’s per turning light. WVTA homologation in process of evaluation. Incorporating LED technology for better illumination of the street. 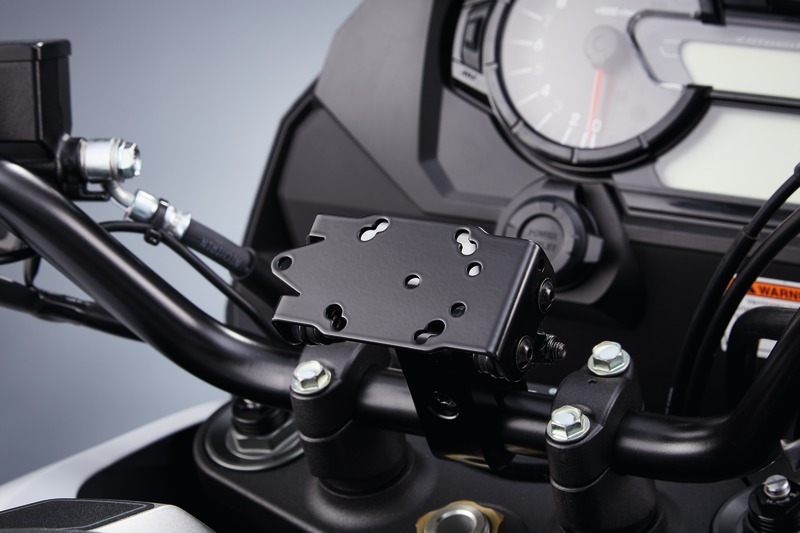 Including installation kit for mounting on accessory bar. 2 LED elements per light, inside a high-tech reflector with very low power consumption (11W/0.8A) and 4400Cd luminous intensity. Set of two. 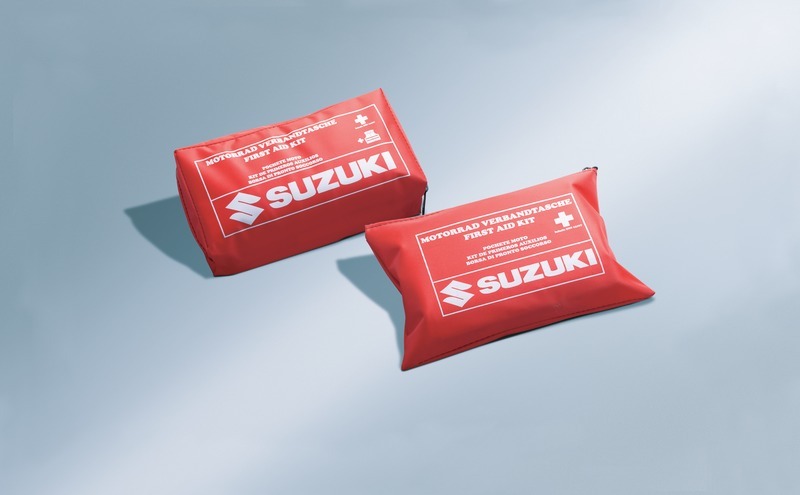 Jointly developed by Suzuki and PIAA. WVTA homologation. 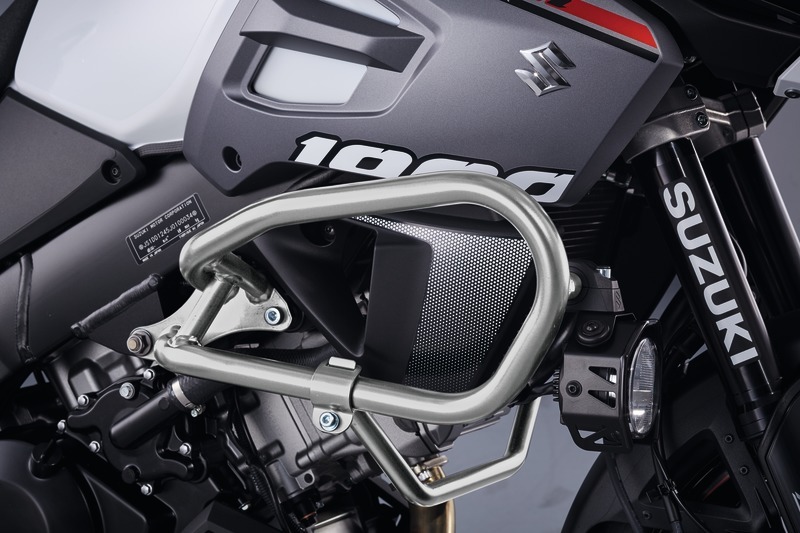 Note: Accessory bar black, (p/n 990D0-31J00-030) or accessory bar silver, (p/n 990D0-31J00-031) as well as fog lamp clamp, p/n 990D0-31J35-000 and fog lamp shroud, p/n 990D0-31J30-000 are required for installation. 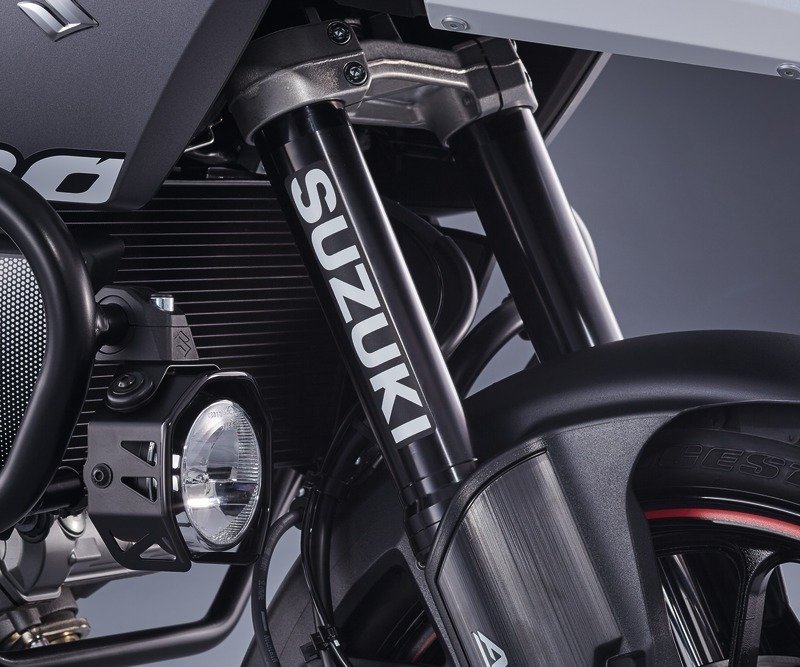 Fog lamp clamp to install shroud and fog lamp to accessory bar. WVTA homologation. 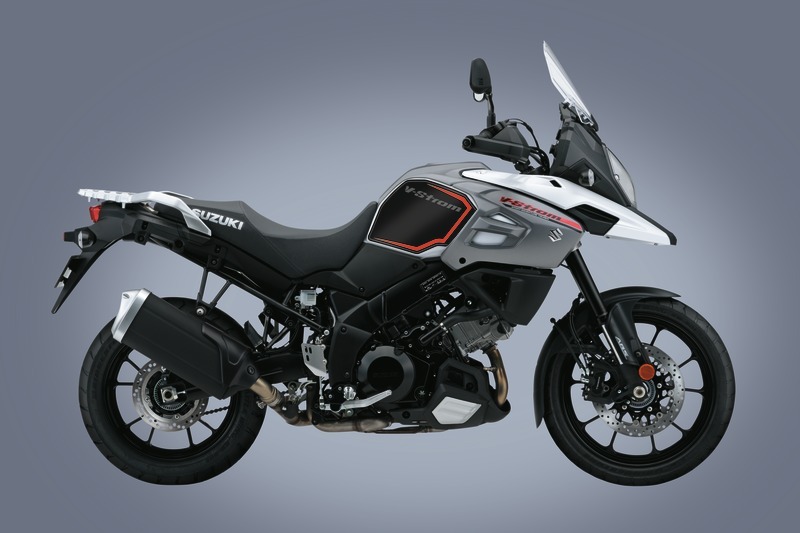 Note: only in combination with fog lamp shroud (p/n 990D0-31J30- 000). 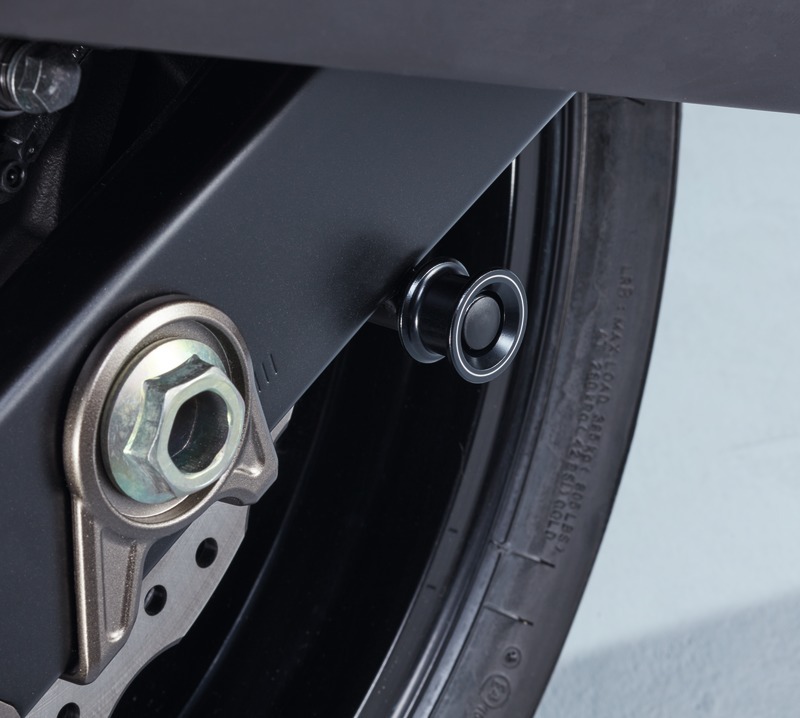 Installation kit to install fog lamp to accessory bar together with clamp. WVTA homologation. 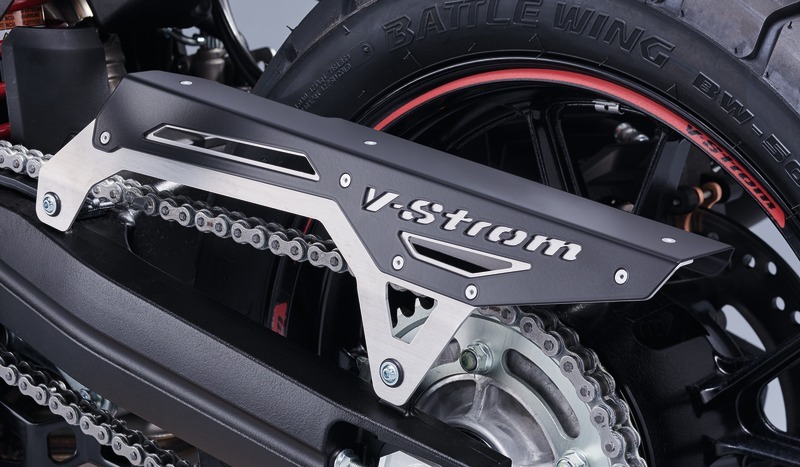 Aluminium This alternative matt black powder-coated/silver aluminium chain guard underlines the real adventure image of your new V-Strom 1000. Replaces OE chain guard. WVTA homologation. 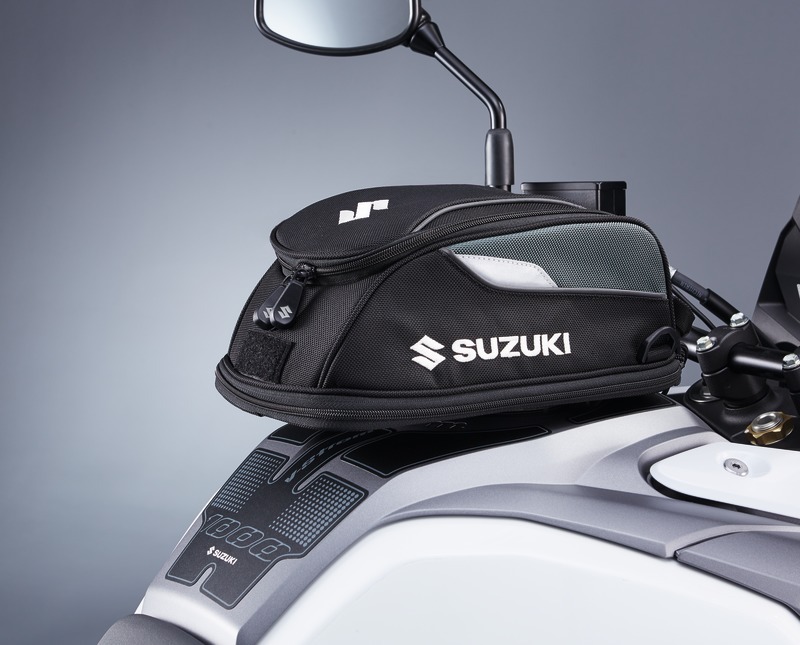 This stylish accessory bar underlines the unique touring look, powder-coated, 2mm steel tube. Required for installation of LED fog lamps. WVTA homologation. 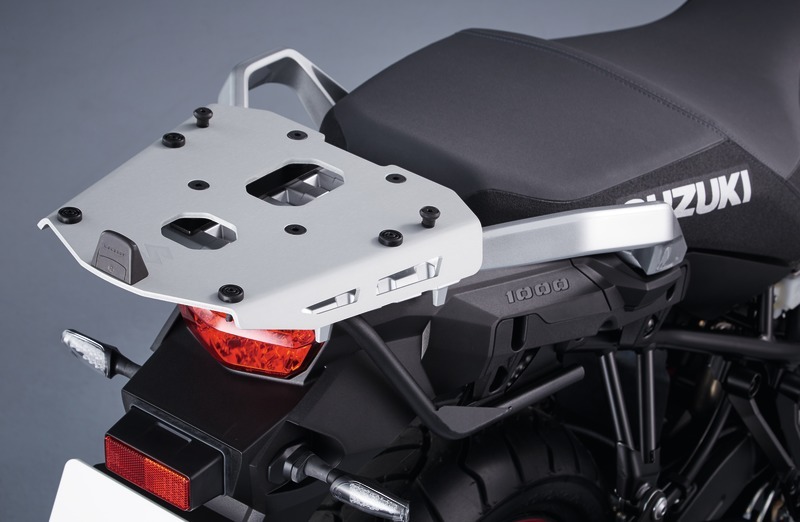 Protection plate in case of any crashes. WVTA homologation in process of evaluation. 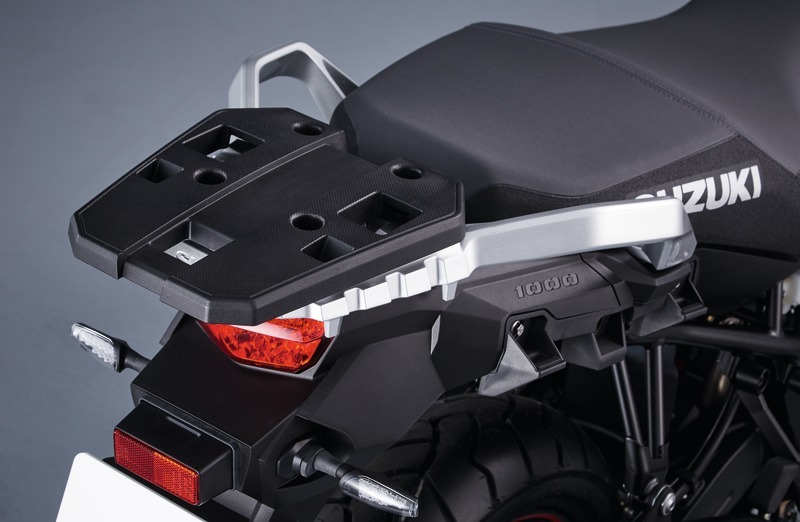 Improves riding comfort of the passenger, to be installed on top case anodized (p/n 93300-31820-000). WVTA homologation. Black Necessary adapter plate to install top case, 35L, p/n 93300- 31820-000. WVTA homologation. 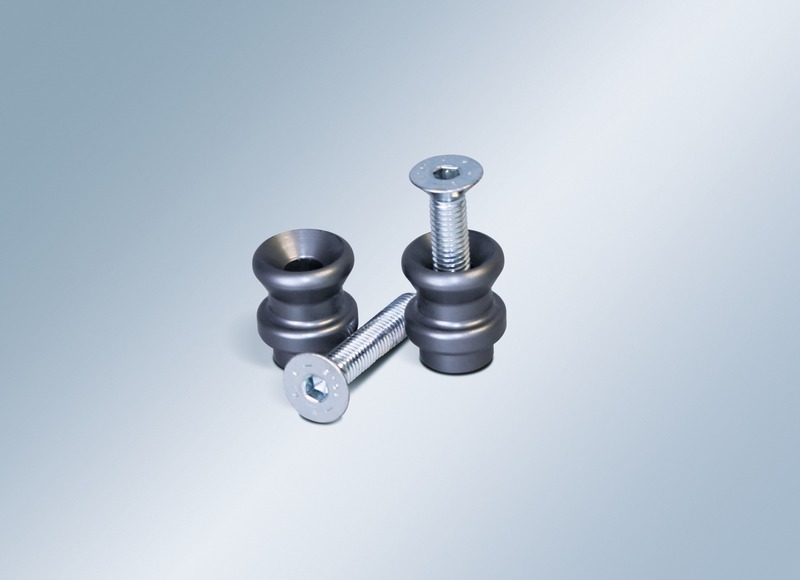 Side case bracket set includes the upper and lower side case bracket for mounting side cases, p/n 93100-31820-000, w/o key. WVTA homologation. 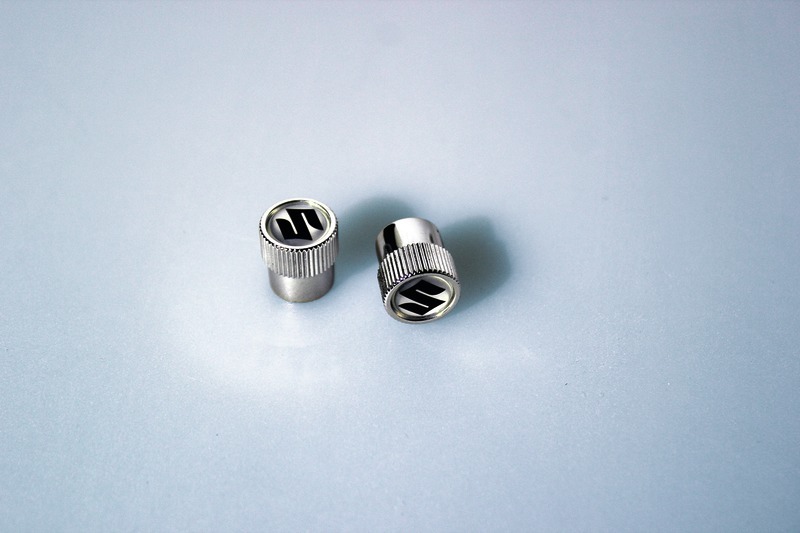 Silver anodized adapter plate necessary to install large top case, 55L, p/n 990D0-E5500-000. 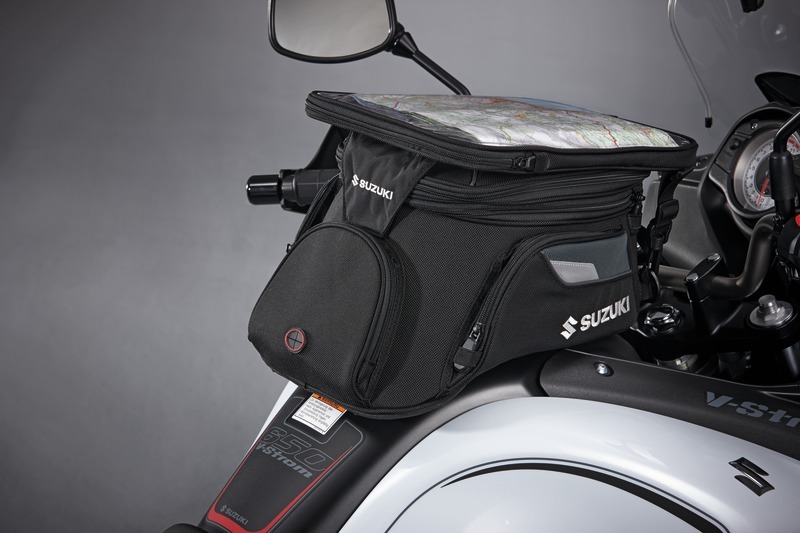 Map case with transparent front. 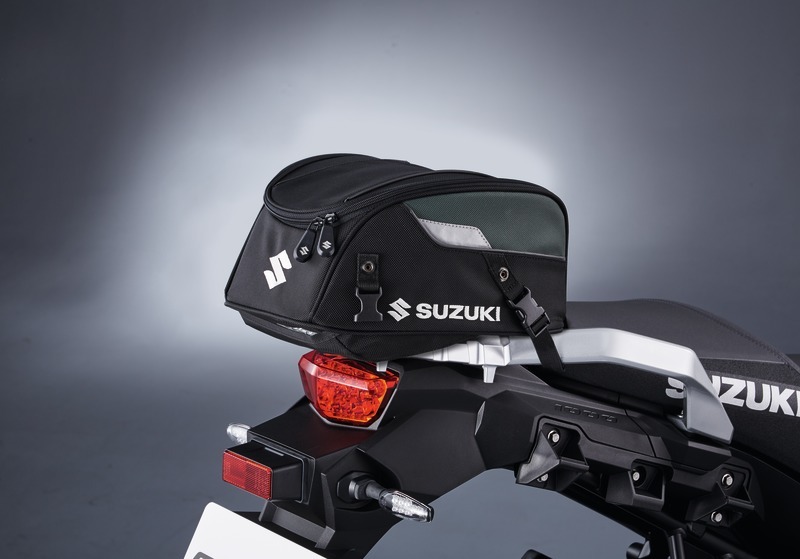 Useful add-on for your tank bag. 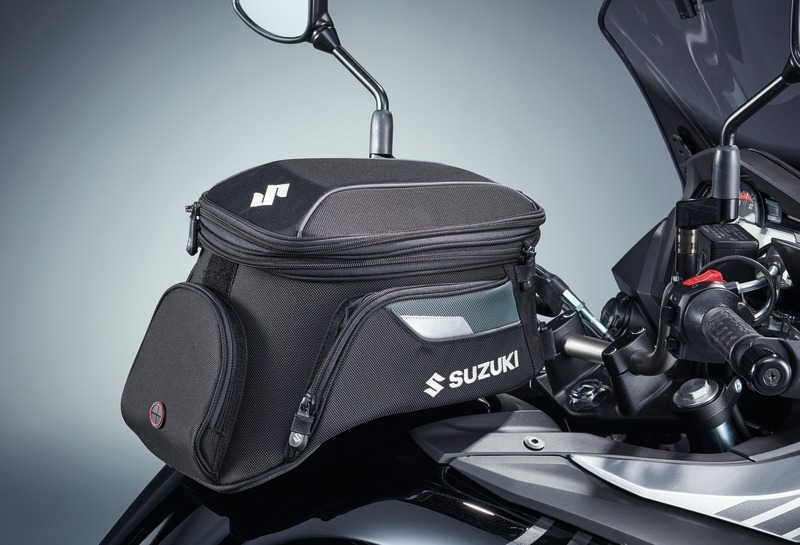 Fits large and small tank bag. Adapter needed to install the large tank bag on tank ring fixation system. 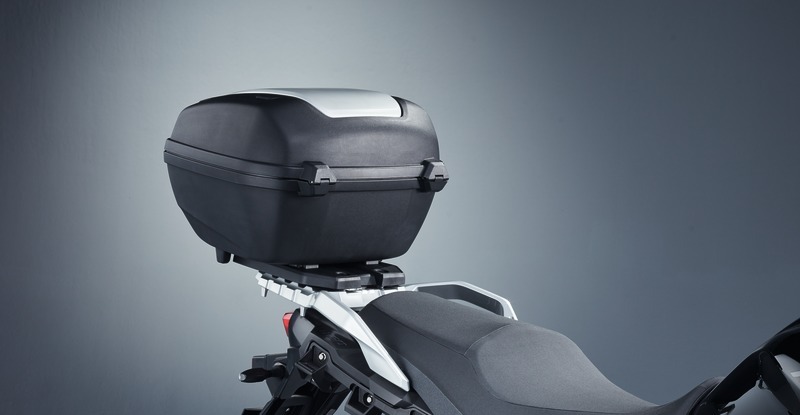 Required item to install tank bag large (p/n 990D0-04600-000) or tank bag small (p/n 990D0-04300-000). WVTA homologation. 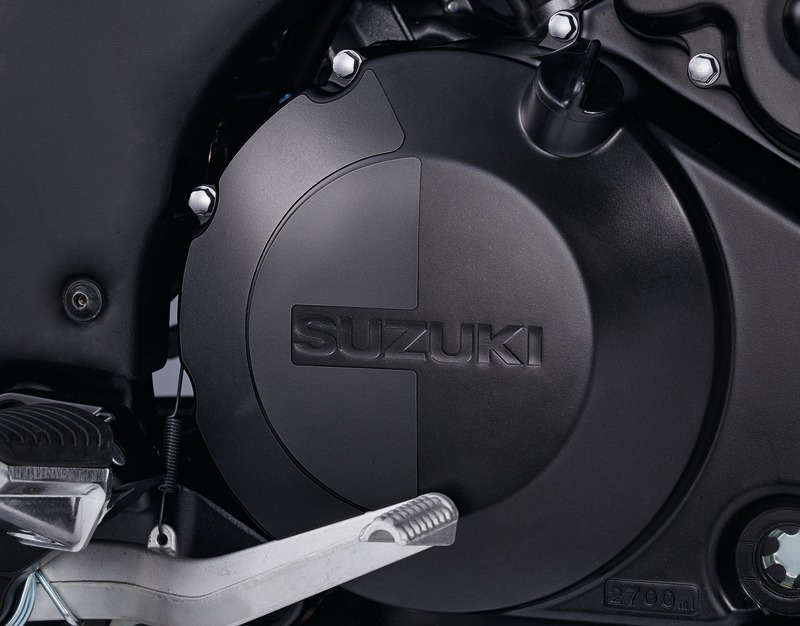 Note: not in combination with fuel cap protection sticker (p/n 990D0- 17K04-CRB or 990D0-17K04-BLK). 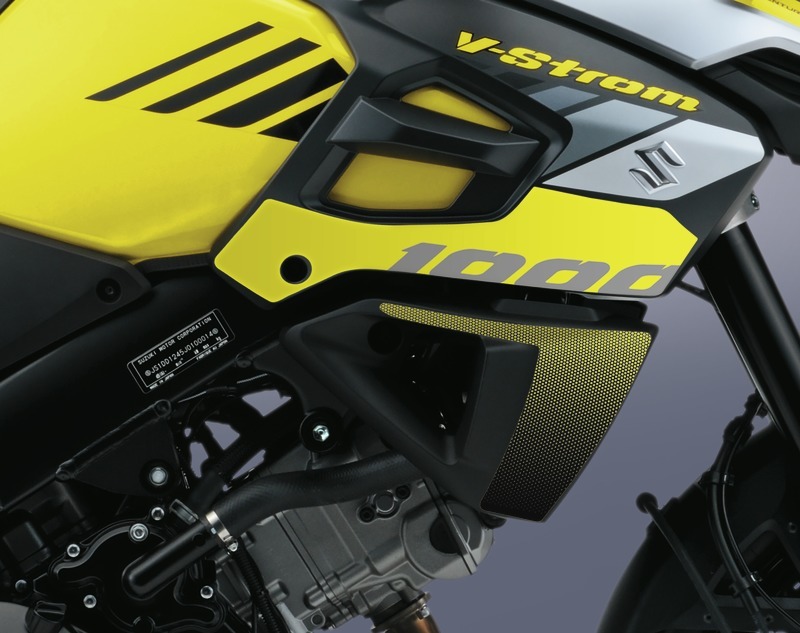 Made of black grained stone chip protection foil with yellow V-Strom logo, protects against scratches. 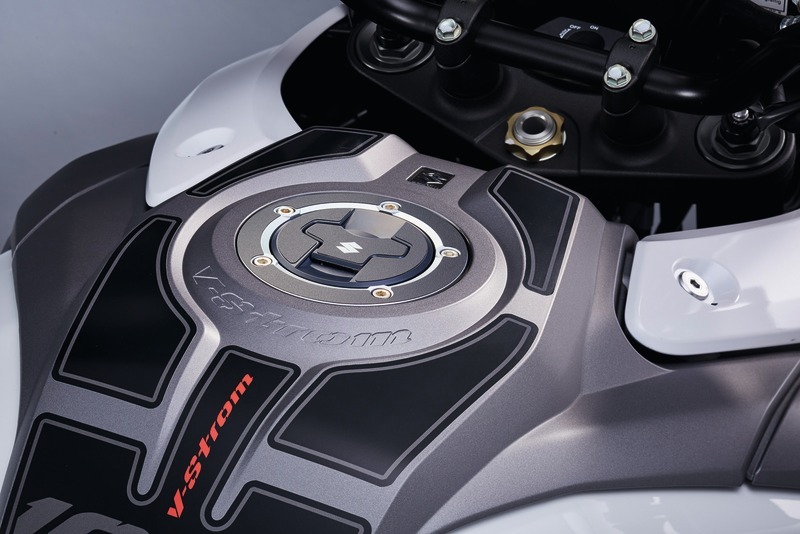 Made of black grained stone chip protection foil with red V- Strom logo, protects against scratches. Complete set for one motorbike (4 single stickers). 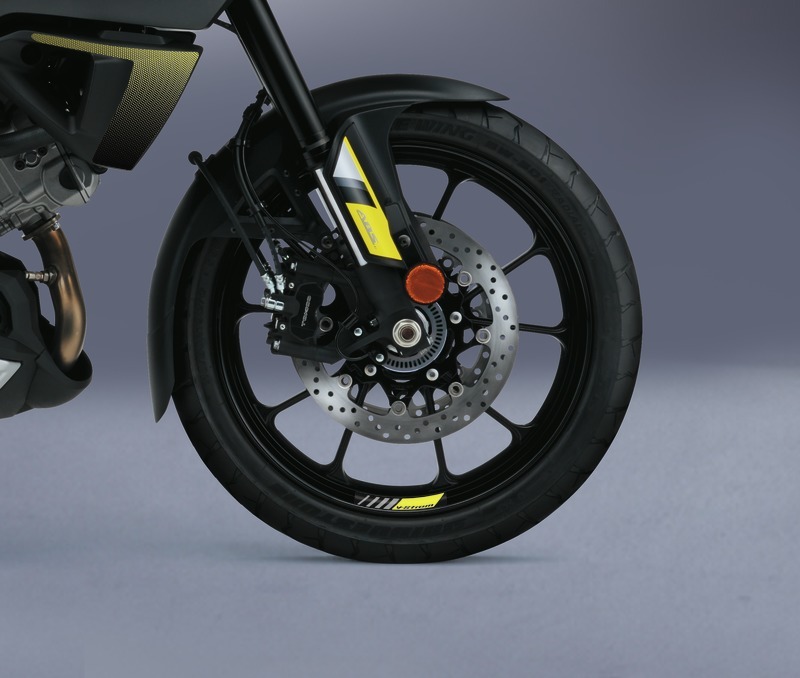 Small decals in yellow for one wheel of your new V-Strom 1000 to customize the bike’s appearance. Set of 2 decals for one wheel. 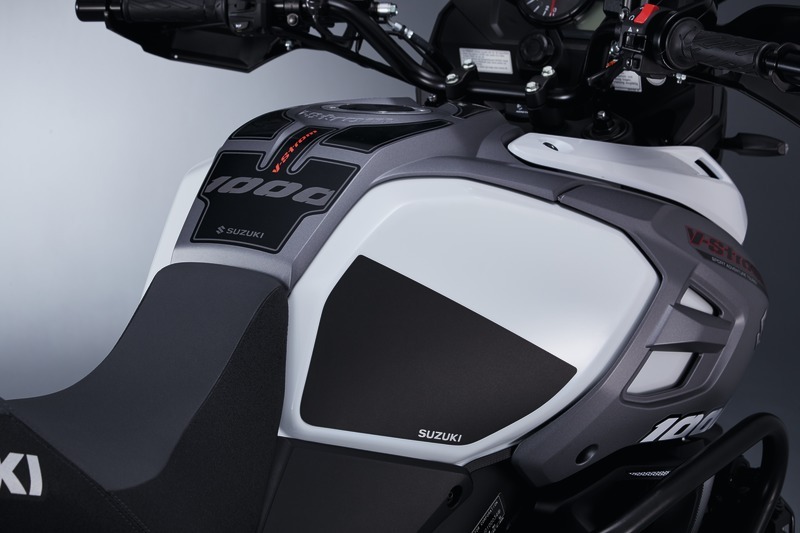 Small decals in red with small V-Strom logo for one wheel of your new V-Strom 1000 to customize the bike’s appearance. 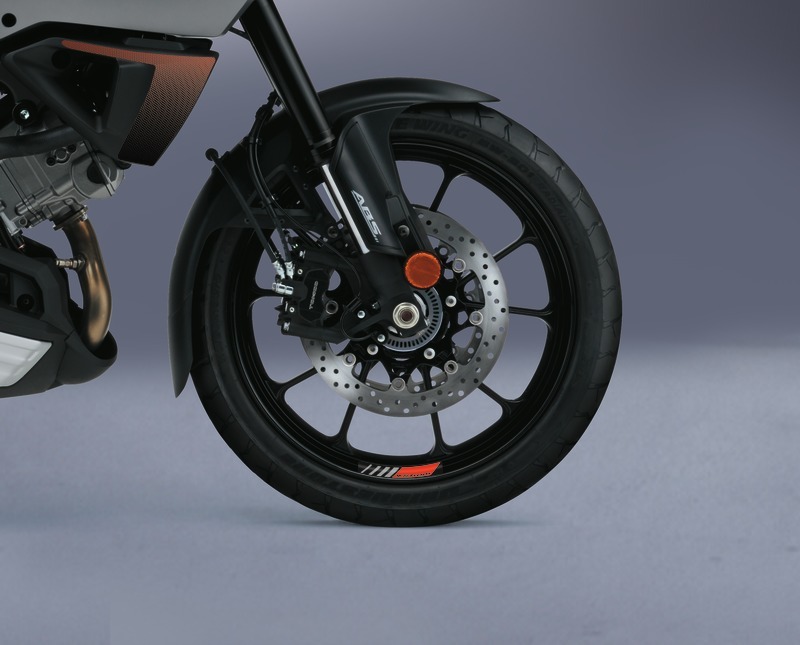 Set of 2 decals for one wheel. 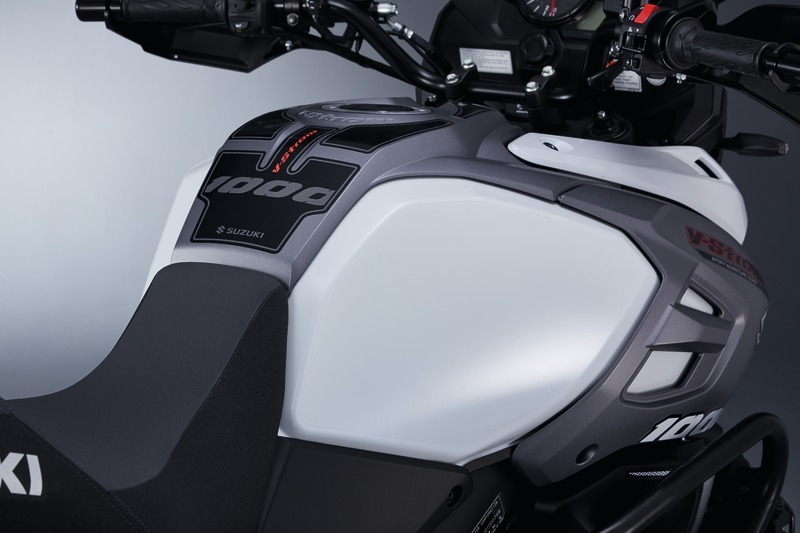 Small decals in white with small V-Strom logo for one wheel of your new V-Strom 1000 to customize the bike’s appearance. Set of 2 decals for one wheel. 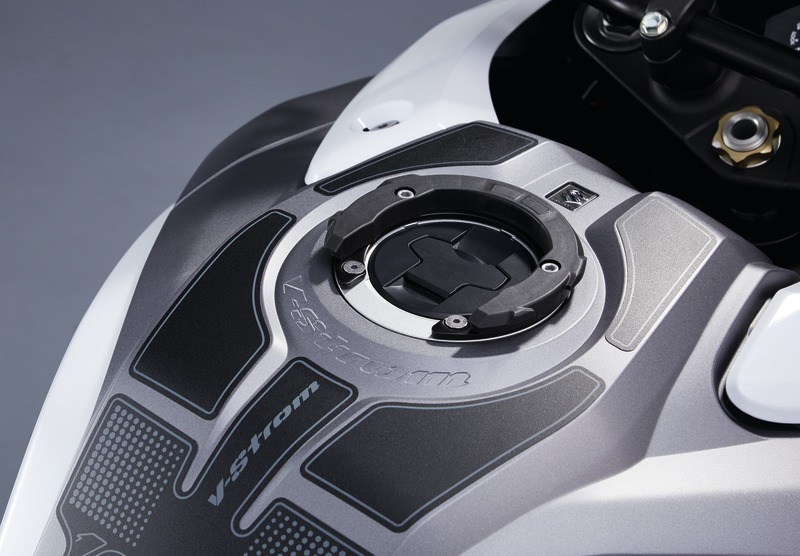 Small decals in grey with small V-Strom logo for one wheel of your new V-Strom 1000 to customize the bike’s appearance. Set of 2 decals for one wheel. 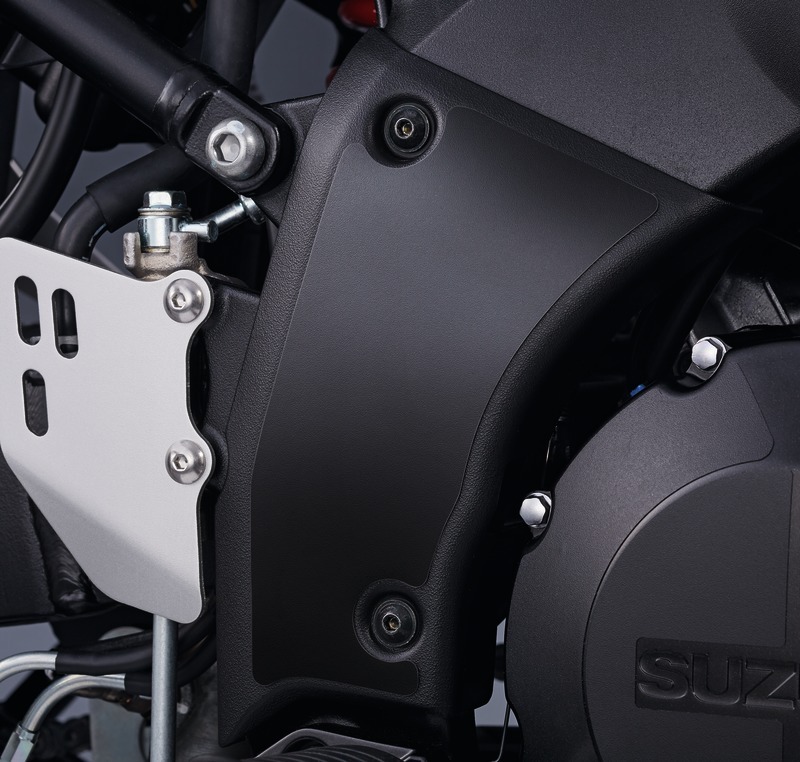 Black grained stone chip protection foil to protect tank against scratches in the area of your knees. Set of 2 pcs. 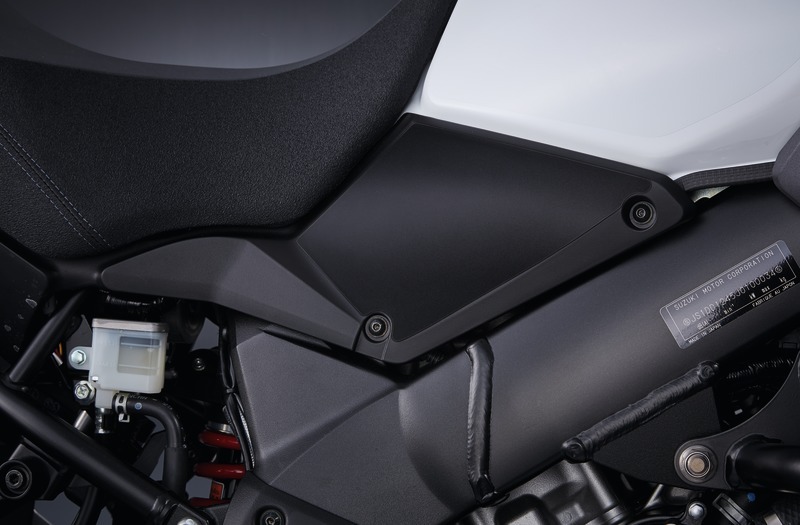 Black/red grained stone chip protection foil to protect tank against scratches in the area of your knees. Set of 2 pcs. Transparent with red design Transparent stone chip protection foil which is almost invisible. For protection of tank against scratches in the area of your knees. Set of 2 pcs. 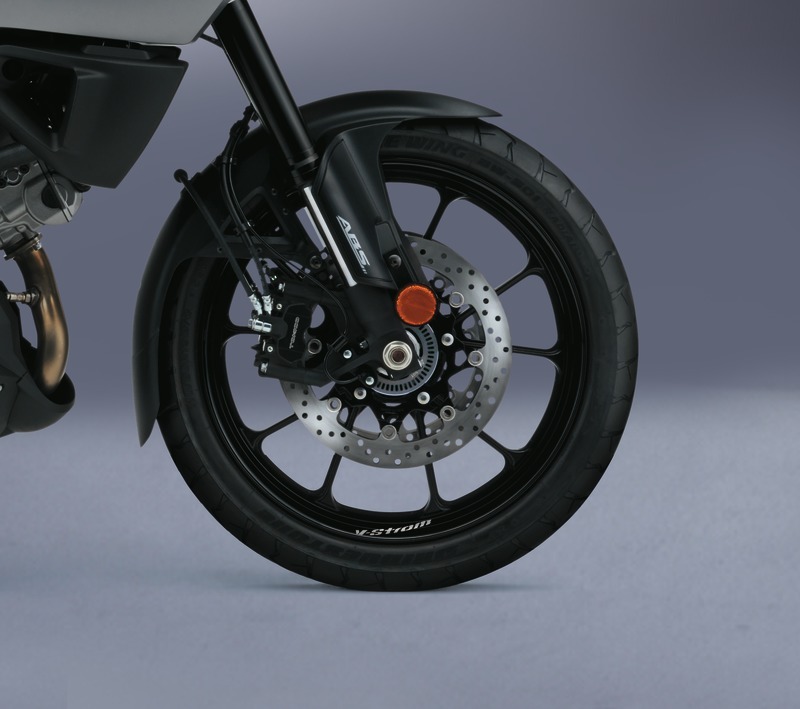 Black grained stone chip protection foil to protect side cover in area of knees against scratches. Set of 2 pcs. 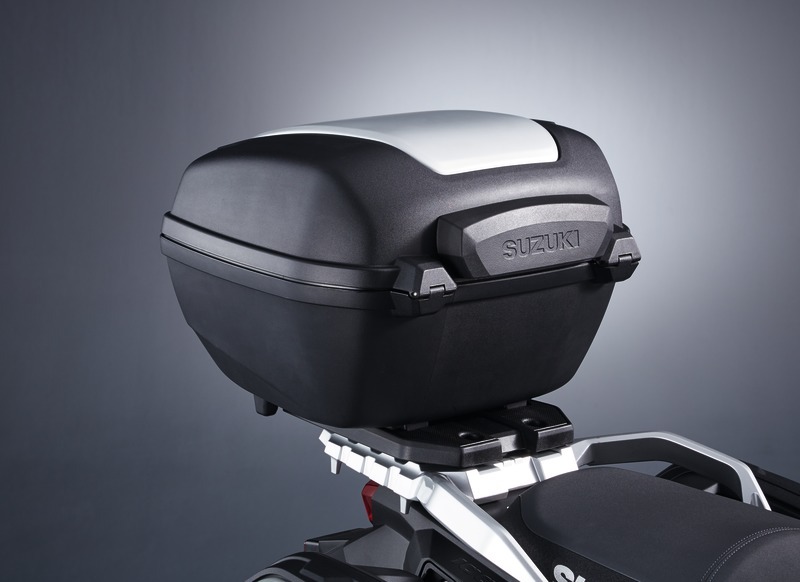 Black grained protection foil to protect side cover in area of knees against scratches. Set of 2 pcs. Transparent protection foil to protect side cover in area of knees against scratches. Set of 2 pcs.